Samuel Watts, the younger, was born 2 April 1774 in Yeovil. He was the second son of Yeovil solicitor Samuel Watts the elder and Mary née Bullock. In 1791, when he was 17, he entered a five-year indentured clerkship with his father. His uncle, Thomas Bullock, acted as Commissioner and signed the indenture. Samuel Watts the younger was to be a solicitor in Yeovil for more than thirty years, from 1796 until 1826. He married Elizabeth Marsh in 1799 at Chew Magna, Somerset. They were to have two sons; Henry Marsh (1801-1877) and Samuel (1803-1879). Elizabeth died in 1816 and Samuel remarried Anna Maria Baghott (1780-1848) on 29 January 1818 at Abergavenny, Wales. Samuel and Anna were to have two sons, both born in Yeovil; William Reed (1811-1896, St Louis, Missouri, USA) and Alfred Bullock Baghot (1821-1893). Samuel Watts the Younger was mentioned in a lease dated 1809 concerning a property called Dichelmoor. Samuel, along with his brothers Edward and Joseph, inherited equal shares in the Chequers Inn, Huish, from their father in 1812. Samuel Watts, the Younger, had at least two sons - Henry Marsh Watts and Samuel, the Youngest - and possibly four sons with his wife Elizabeth, each of whom was steered towards the law. Elizabeth Watts died in Yeovil in 1815, and Samuel started another family with Anna Maria Baghot (1780-1848). The first-born son, Henry Marsh Watts (1801, Yeovil - 1877, Yeovil) became articled to his father for five years starting in 1819. The affidavit for this arrangement was approved for the Court of King’s Bench by his uncle, Thomas Bullock Watts. The second-born son, Samuel Watts “the Youngest” became his father’s clerk in 1824. This was the year in which Henry Marsh Watts would have completed his time as an indentured clerk to his father. An 1815 lease in my collection refers to "Samuel Watts the Younger of Grove House". Samuel was in a solicitor partnership with his brother Joseph, but Joseph ended the partnership in 1811. Joseph had acted for their brother George in his charity case, but had upset the arbiter to the extent that the case remained unsettled. Pigot's Directory of 1822 listed the bank of Samuel Watts & Co and Samuel was also listed as one of the seven Yeovil solicitors. Pigot's Directory of 1824 listed Samuel as an Attorney of Kingston, he was also listed as the agent of the Royal Exchange Fire Insurance company. Yeovil Bank was a private bank established by Samuel's father, Samuel Watts the Elder. The bank was probably founded around 1810 and was certainly active during the early 1820s. A reference in the London Gazette in 1812 has it Watts Marsh & Co. (Samuel the younger, his brother Joseph Watts and Thomas Marsh). The Nossiter bankruptcy of 1815 has as one of his creditors Messrs Watts Marsh & Bullock & Co. Later in 1815 it was announced that this banking partnership was dissolved by mutual consent under the signatures of Samuel Watts the Younger, Thomas Marsh, Thomas Bullock, and James Glyde. Daniel Vickery, writing in 1856, referred to Yeovil's third bank as Samuel Joseph Watts and Cayme. By 1830 Samuel's bank was, naturally, no longer listed in the trade directories, nor were any of the three Watts brothers listed as Yeovil solicitors. Samuel's sons were articled to him; Henry Marsh in 1919 and Samuel (the youngest) in 1824. However in 1827 Samuel the younger moved to Bath and his son Samuel the youngest's clerkship was transferred to his brother Henry Marsh, who took over their father's business on his removal to Bath. In 1835 a deed to a property in Mudford Road referred to Samuel as "formerly of Yeovil, now of Bath, Gentleman". The 1830 Directory for Bath, Somerset shows a firm Samuel Watts & Son located at 15 Westgate Buildings. In the 1839 Bath Directory that firm had become simply Samuel Watts, 12 Argyle Street, one of 66 such firms in Bath. In the 1842 Bath Directory the entry is Samuel Watts, Attorney, 2 John Street. In the 1841 census Samuel and Anna were living in Bathwick with their son William Reed and his wife Sophie and their three children together with their other son Alfred Bullock Baghot. Samuel Watts the Younger died on 7 February 1843 aged 69. Samuel Watts the younger, Solicitor and Banker of Yeovil. 1774-1834. 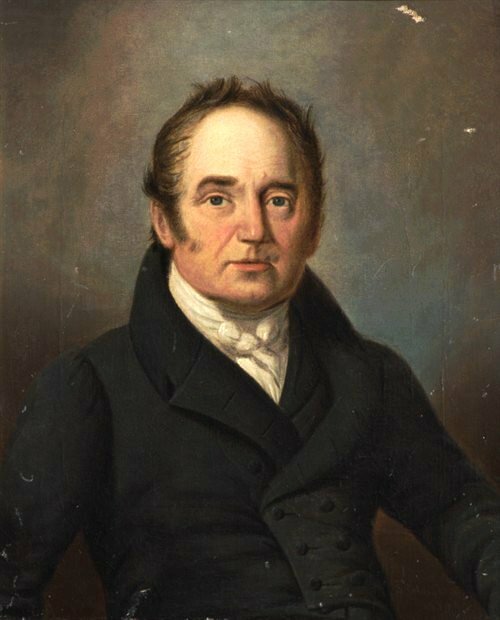 This portrait is by Samuel Colman (1780-1845). Samuel Colman and Samuel Watts were related by marriage - Samuel Watts' sister, Grace, being married to Mary Colman's brother, James Cayme the Younger. The signature and seal of Samuel Watts on a lease indenture of 1812. Grove House, Preston Road, was Samuel Watts the Younger's home - certainly in 1815. 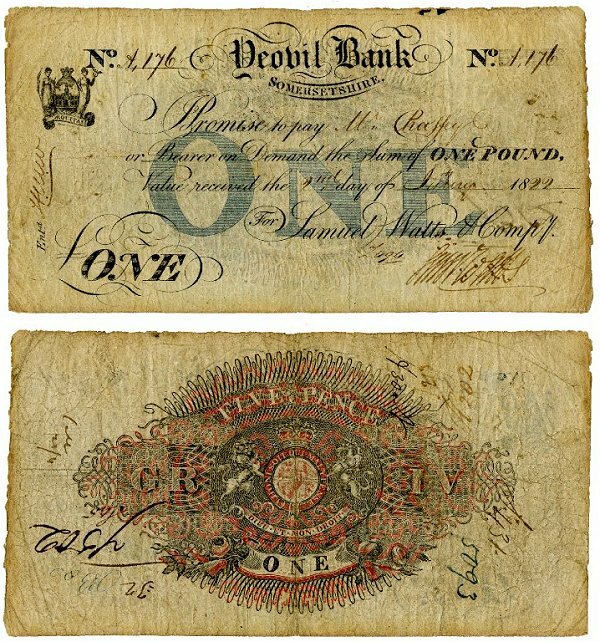 The obverse and reverse of a Yeovil Bank £1 note of 1822 (about £77 at today's value). The bank, run by Samuel Watts & Co, would then have gone out of business on 8 November 1823, when Samuel Watts the Younger, scrivener and banker, was declared bankrupt.